Welcome to Inner Flow Tai Chi at Unity Martial Arts! Tai Chi Chuan (taijiquan) is a traditional Chinese martial art that is also practiced for health, balance, and vitality due to its slow, graceful forms and concentration on inner awareness, relaxation, balance and strength. Chi Kung (qigong) is the practice of increasing and conserving your vital life energy through slow minimal movements and breathing. My classes cover the traditional Wu Family forms as practiced in Shanghai, China, and I include the health benefits, the Chinese traditional medical theory, and the martial aspects and applications. 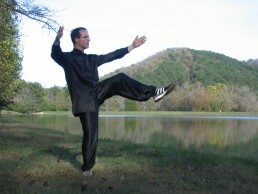 I have over 40 years of martial arts training, and 20 years in Traditional Chinese Medicine and acupuncture. My teacher, Johnny Lee Kwong Ming, is world-reknown, and a disciple of the famous Master Ma Yue Liang of Shanghai. I lived in Shanghai for about a year and studied with Ma Jiang Lin, Master Ma’s son. I have also studied the related arts of bagua zhang and xingyi quan with Master Lee and other teachers including Luo Dexiu of Taiwan and Dr. Marcus Brinkman. Our Tai Chi classes have a meditative atmosphere. Students follow along as the class works through a chi gong warmup and the traditional forms and advanced students continue on to more involved forms while beginners repeat the basics. While movements are slow, expect to be sore the next day. Slow doesn’t equal easy! Students wear comfortable workout or yoga clothes. Tuition varies depending on number of classes you attend.